In San Salvador, the candidacy of Carlos Rivas Zamora clearly siphoned off enough FMLN votes to potentially give the election for mayor to ARENA. If the FMLN did not insist on its rigid party orthodoxy and was sufficiently inclusive for Carlos Rivas Zamora to stay in the party and be its candidate for mayor or if the party had formed a coalition with one or more of the minor center-left parties, it is likely the FMLN would have had an easier time staying in control of San Salvador. Both ARENA and the FMLN made gains in the election in the number of deputies they have in the National Assembly. 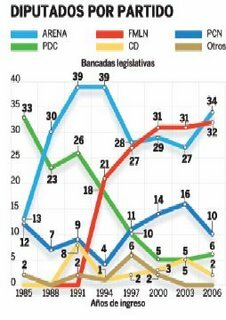 The losers in the legislative elections were the minor parties. The FMLN increased its total from 29 to 32. (The FMLN won 31 seats in 2003, but 2 deputies left the party during 2005). ARENA increased its total number of deputies from 27 to 34. Thus ARENA improved its position, but not as much as Tony Saca hoped, and almost all of its gains were at the expense of its traditional ally, the PCN, which lost 6 seats in the assembly. The FMLN barely regained the ability to block measures which required a super-majority vote, such as government borrowing, which it had lost when two deputies defected from the party in 2005. Where the FMLN saw significant losses was in control of mayor's offices. ARENA made significant gains throughout the country, including winning control of traditional FMLN strongholds such as Chalatenango and Tonacatapeque. Part of ARENA's success on a national level is no doubt related to the popularity of Tony Saca. His approval ratings are very high in the country, and Saca campaigned ceaselessly and unapologetically for ARENA candidates from one end of the country to another. The implied message that towns controlled by ARENA mayors get better treatment from the national government may have helped ARENA candidates. Turnout for the elections was reported at 50%, up significantly from the 37% turnout in the last municipal/legislative elections. These elections again highlight the intense polarization of politics in El Salvador. The harsh rhetoric of the parties and the almost 50-50 split of votes between the two major parties in the total votes cast for deputies in the national assembly does not bode well for having a functioning government where the politicians try to work together for the greater good of the country. In San Francisco Menendez, the former "coyote" human smuggler Narciso Chicho Ramirez, won the race for mayor in that district. In Intipuca, the incumbent ARENA mayor defeated Hugo Salinas, the Virginia resident who returned to his hometown and campaigned in English. In Nejapa, popular mayor Rene Canjura had defected from the FMLN and ran under a minor partycoalitionn banner. He was victorious. 1. The FMLN moved not from 29 deputies to quite a few less than that. Remember that in 2004 there were several moderates that stopped voting with the FMLN. With 29 votes, you can still block a 2/3 majority. They had less than that, although I can't remember just how many. The significant thing about the 33 seats, then, is that these are all loyal, hardliners. The party is more "conservative" than ever. 2009 is going to be more of the same, except that ARENA has always proven more able to come up with a decent candidate than has the Frente, so I'd safely place my money on them. 3. I dare say that this may be the least capable group of deputies that we've seen in the post-war period. Okay, maybe I'm biased simply because I don't recognize many of the people. And I hope I'm wrong. But I still believe things were so much better back with the 1994 assembly (similarly, the 1994 Supreme court was also the best in recent memory -- less politicized), in large part because of a good cadre of smart center-left politicians, who generally run circles around every one else. Who are the able legislators in either of the two major parties at this point? I can't really tell you. Let me amend that comment. On second look, there's quite a bit of continuity between the 2003-2006 assembly, and the 2006-2009 assembly, in all parties. However, I still think that gradually the quality has diminished. Of course, I am NOT mourning the defeat of Ciro Cruz Cepeda! I'd be interested to see whether there are any homegrown sources that reported the complaints in the Oriente from people who said their home had been visited by supposed census-takers, whom they suspected of actually being name-gatherers for vote fraud. I'm not supporting or refuting the suspicion, mind you, just reporting it. In the countryside in Morazán this appears to have been widely believed; I know my mother-in-law said it more than once in 2004.